California Wildfire Report: Where are all the wild horses and burros? A wildfire started on Sunday, August 12th, 2012 from an apparent lightning strike and by the time it was contained on August 30th it had burned over 315,577 acres in California’s largest legally designated Wild Horse and Burro Herd Management Area, Twin Peaks. Craig Downer, Wildlife Ecologist and “Grandma” Gregg, Environmental Researcher are experienced wild horse and burro observers and both familiar with the Twin Peaks Herd Management Area where the majority of the three days were spent searching for Wild Horses and Burros and documenting the extent of the fire damage. Over 22 hours and 114 miles covered plus hikes into some remote off-road areas. Travels included many stops to search with binoculars to look for any signs of wildlife – dead or alive. 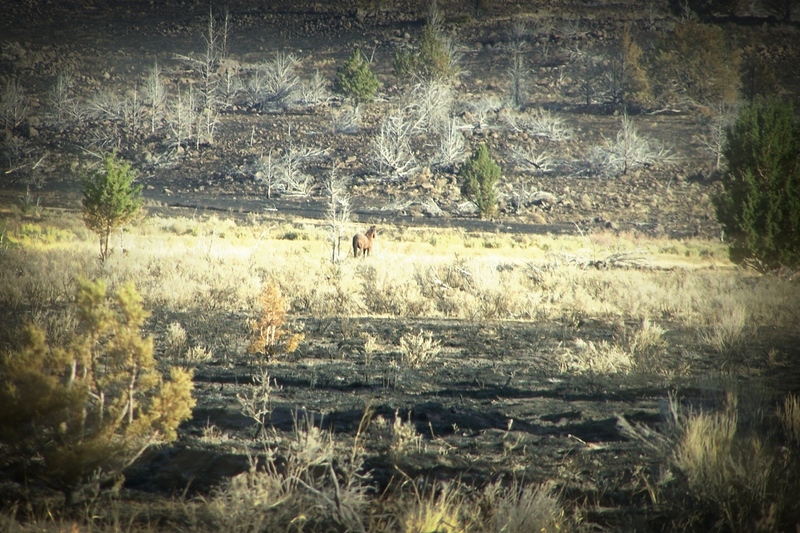 Any live large and medium animals would be easier to locate in the burned areas due to lack of forage cover and any dead animals would be more difficult to find because of the grey-black color of the burned landscape. During our three long days of traveling through the Wild Horse and Burro Herd Management Area we only found 22 wild horses and 3 burros. Over and over we kept thinking about the Bureau of Land Management’s population reports claiming that more than 952 wild horses and 192 wild burros are currently living in the Twin Peaks Herd Management Area. There is significant evidence that the population is much smaller. Since the 2010 roundup, we have made many trips into the Twin Peaks Herd Management Area and our trips have found very few horses and burros remain in this vast area. It is apparent that the BLM has overestimated the population of wild horses and burros that remain since the 2010 roundup. Our observations are consistent with an independent aerial survey completed in 2010 after the roundup, which estimated only 84-265 wild horses and a small population of burros remained in Twin Peaks. The few that remain here in the nearly 800,000 acre Twin Peaks Wild Horse and Burro Herd Management Area are special and have the right to stay here and be protected as is specified under the law. 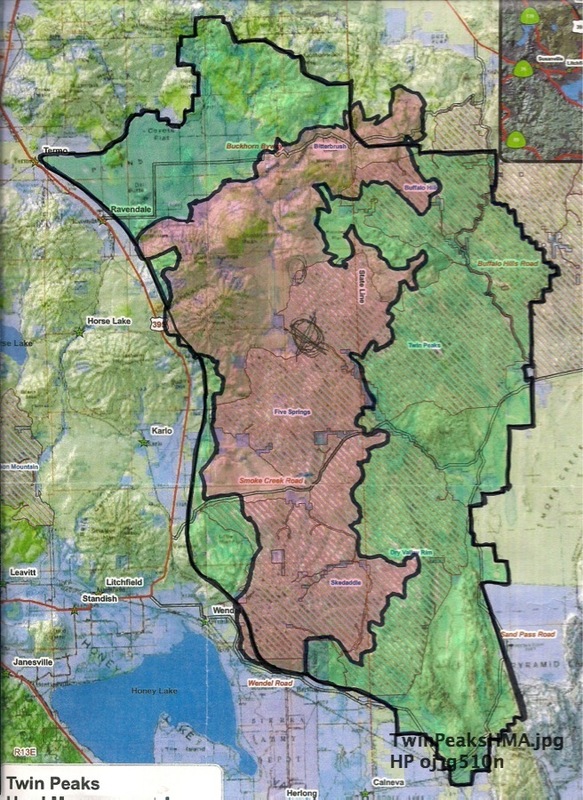 The BLM stated during the fire that in the course of aerial flights over the Twin Peaks Herd Management Area they saw only about 100 wild horses in the unburned eastern portion of Twin Peaks. Furthermore, when we were searching the area we met several BLM employees surveying the fire damage. 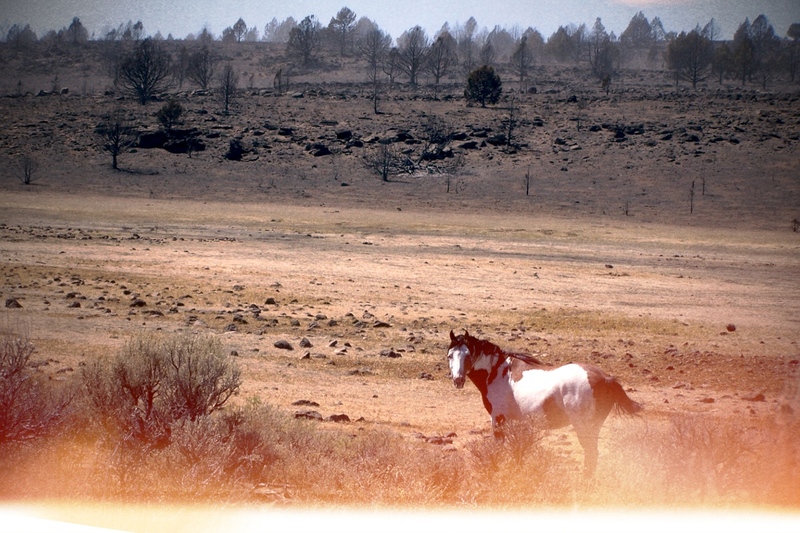 One BLM employee said he had been observing the Wild Horses and Burros for thirty years and knew the area and animals intimately and although he said he had covered almost all of the HMA, he admitted to finding only one horse on the entire area in three weeks of searching. The BLM employees made it very clear that in their opinions the fire crews made every effort to protect private property and utilities but let the rest of the public’s land burn almost uncontrolled and this was verified by our observations. We drove to one of the largest water sources on the HMA. The springs were in excellent condition but since this is one of the few lush watering areas for many miles and because we arrived in the evening (normally the most active wildlife watering time of day), the stillness and lack of animals was very noticeable. Although there were some animal tracks and lots of cattle feces, with the exception of some small fish in the pond area, we witnessed no wildlife, heard no sounds of birds or insects or rodents scampering; all the normal things a person would expect to encounter in this remote watering hole during the evening. It was noticeable to the point of being eerie and indicated to a person experienced in nature to believe that the surrounding fire had caused far more damage than the obvious blackened sage and juniper and grass and that in fact, many animals had perished in the fire. The silence spoke volumes.